The Chinese military is making preparations for the inaugural flight test of its newly designed unmanned combat vehicle, bringing the Asian powerhouse into the stealth technology race, Chinese media report. China’s first unmanned aerial vehicle (UAV), known as the Lijian ('sharp sword'), is designed jointly by the Hongdu Aviation Industry Group and Shenyang Aviation Corporation. The project was launched in 2009 and the drone's first ground test was conducted on December 13 last year. The Lijian, which makes China the third country to possess stealth drone capabilities, is now ready for flight testing, China Aviation News reported on Friday. The Chinese UAV is designed for use by the PLA Air Force and Navy Air Force for combat missions, China Aviation News reported. It may also be used for tracking and reconnaissance along China’s lengthy and occasionally contentious border. Beijing’s ambitious efforts at developing its drone capabilities have not escaped the attention of Taiwan, which has quarreled with Beijing in the past over questions of sovereignty and national identity. 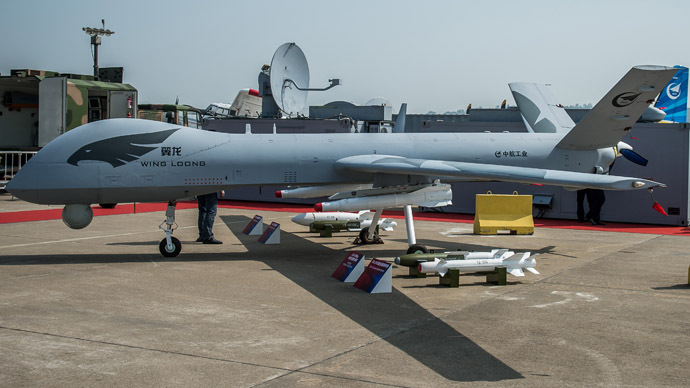 “Taiwan should be concerned about China’s development of large numbers of sophisticated military UAVs,” Ian Easton, a research fellow at the Project 2049 Institute, told the Taipei Times. China’s stealth drone is third such unmanned combat vehicle in existence, after the X-47 designed by the United States, and the nEUROn, a collaborative effort of various EU companies. The nEUROn was launched in 2005 following an order by the French Defense Procurement Agency. The program is a collaborative effort between French, Italian, Swedish, Spanish, Greek and Swiss defense companies. The US Pentagon’s X-47 stealth drone, designed by Northrop Grumman, began as part of DARPA's J-UCAS program, and is now part of the US Navy's UCAS-D (Unmanned Combat Air System Demonstration) program. The X-47 is still undergoing flight testing. The unveiling of the prototype places the People’s Republic of China ahead of several nations in the development of stealth drone technology. India, Iran, Israel, Italy, Sweden and Russia also have their own stealth UAV programs.